” One of the very nicest things about life is the way we must regularly stop whatever we are doing and devote our attention to eating.” Luciano Pavarotti, as quoted on a wall in Minibar. If any restaurant follows this credo, it’s Minibar. There is a great deal of eating involved, but it is so much more than that. 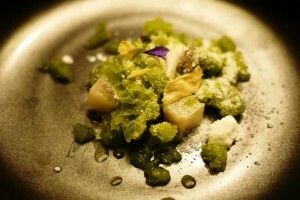 José Andrés’ ultra-innovative, super-expensive spot in DC’s Penn Quarter is an experience that engages all the senses. 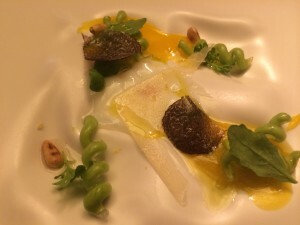 Minibar’s multi-course extravaganza is one I pined for over the past few years, yet couldn’t commit based on cost ($250/pp), and the reported difficulty in snagging a reservation at the 12-seat restaurant. But after dining last year at the similarly-priced Alinea in Chicago, the bar has been raised. I understand how dining at this level can actually be worth the expense. And fortunately, my husband shares this line of thinking. I am finally propelled here by a confluence of circumstances. I have been an admirer of Minibar’s Executive Sous Chef Johnny Spero since his days at the gone-too-soon Suna. His enticing food photos on Instagram have been speaking to me. The sound is imaginary, but I find it impossible to resist. More importantly, I have been given a gift certificate from my children to cover the cost of my meal. (This is the year I have an answer when they ask me what I want for Mother’s Day and my birthday). Most importantly, I am able to get a reservation on my first ever attempt. 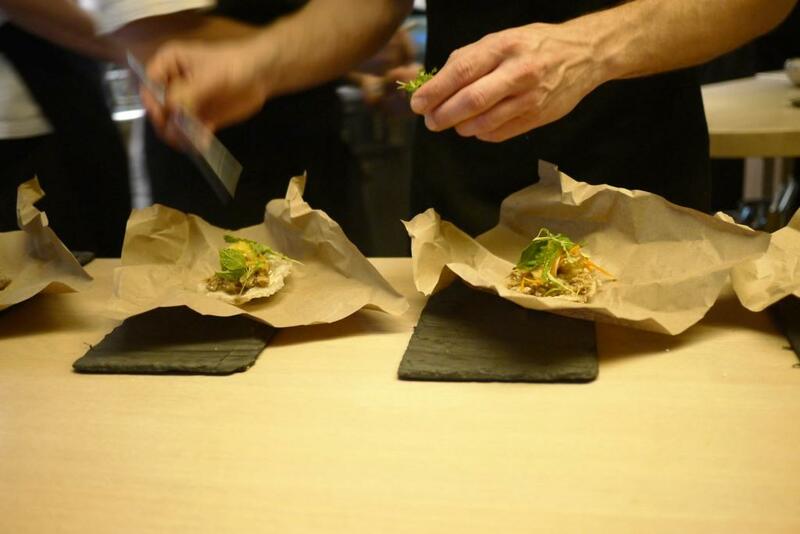 Dining at Minibar is an intimate experience. Guests sit at a counter, arms-length from the team preparing our food. 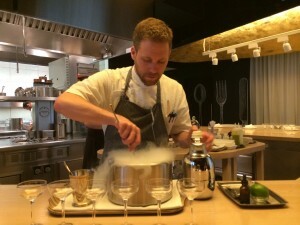 As we are ushered to our seats, Chef Spero is whipping up a magical concoction. It is the makings of a hot and cold frothy pisco sour. We are mesmerized by the precision, art, and science that is being applied to a cocktail. Minibar is distinguished from many other multi-course tasting experiences by the up-close-and-personal view. This includes an opportunity to interact with the team. Anticipation builds when we witness the intense concentration of a chef pouring over a mysterious concoction or meticulously applying a finishing touch with tweezers. They respond in kind to our delighted reactions as aromas drift over to our side of the counter, and then to our expressions of pleasure as the essence of the flavors sink in. The 26-course meal begins with playful finger foods. Looks are deceiving as somewhat typical-appearing pizza margarita, late-night chicken shawarma, and pineapple shortbread command our attention with powerful flavors. A piquant yogurt sauce accompanies the shawarma. Chef Spero encourages us to use our fingers to swipe up any of the extra sauce. Nice touch. 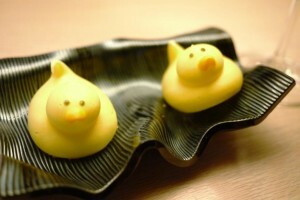 “Rubber ducky” adds a touch of whimsy. The meringue duck encases a foie sorbet for me, and a citrus sorbet for my husband. The dish amuses, and the taste is seriously delightful. It’s intriguing to watch the intricate preparation of Vietnamese pig ear. We are ultimately left to our own devices, as we are handed a dropper of spice and instructed to add heat based on our own tolerance level. A number of dishes must be modified or switched out entirely for my kosher/pescatarian husband. As the evening progresses, he is increasingly impressed with the handling of his dietary restrictions. 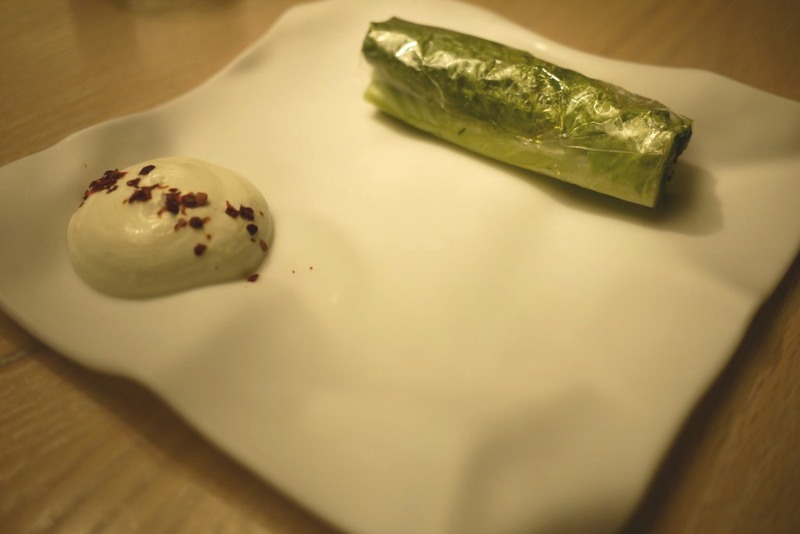 We have indulged in tasting menus where proteins have simply been left off the plate, leaving him feeling shortchanged and hungry. 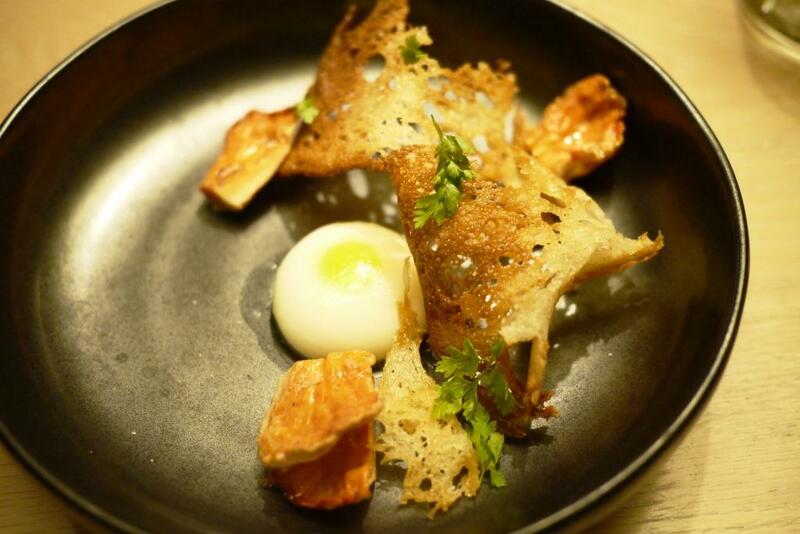 At Minibar some of his dishes, including parmesan egg with migas, are entirely different from what the meat-eaters are being served – and just as enticing. Beech mushroom papillot with truffle revs up the sensors, as a delectable smell is released from smoke-filled balloons. 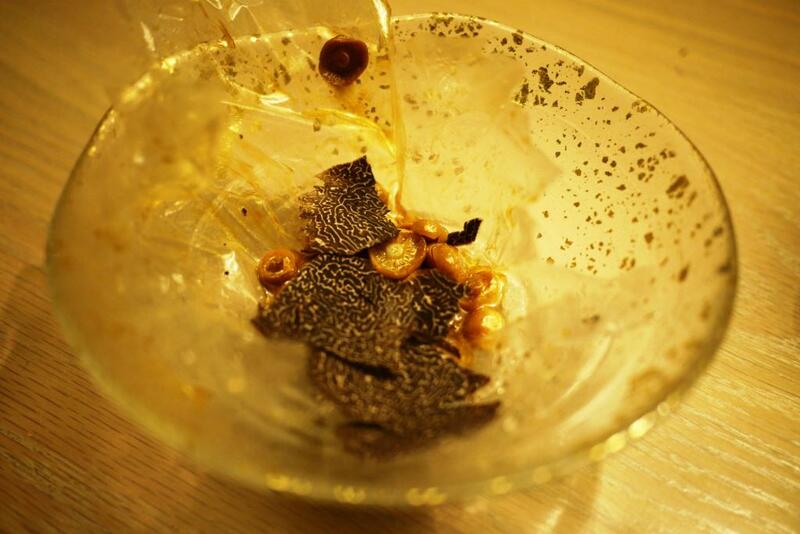 Black truffle is shaved on top to further enhance the dish. My appetite is starting to wane just as the savory courses come to a close. The sweet dishes perk me up again. 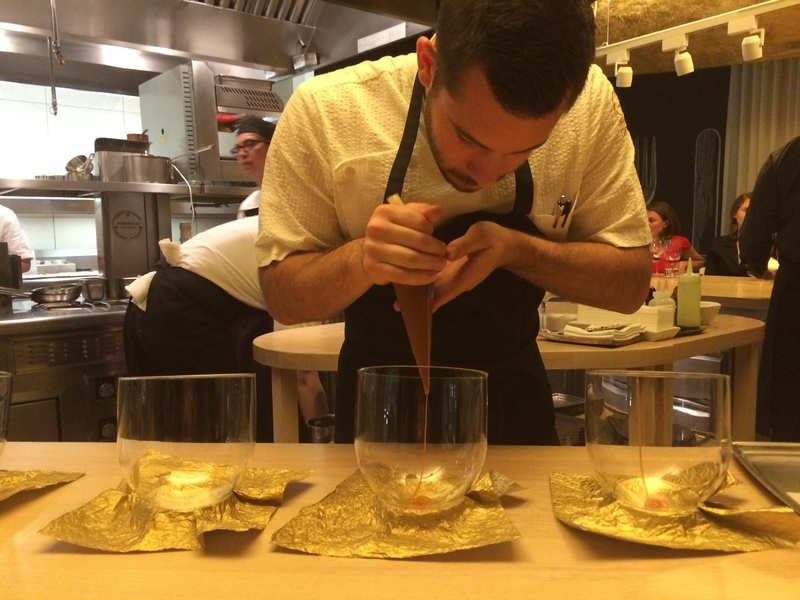 “Spring Thaw” is Minibar’s ode to the DC winter that didn’t want to die. It combines slush with just a few edible flowers peeking through the ice. Candied cucumbers elicit a gasp, with an unexpected intensity of flavor. The preparation of “Chocolate Hay” is alluring. The powerful scent of ginger accompanies swirls of caramel and shards of chocolate, lulling us into the false sense that we are approaching a delicious ending to our meal. But there is more. Chef Spero ushers us into the adjacent Barmini cocktail lounge, where we continue to indulge in sweets, coffee, and optional cocktails. The sensory stimulation continues, with a pump up in the volume and a continued focus on visual appeal. 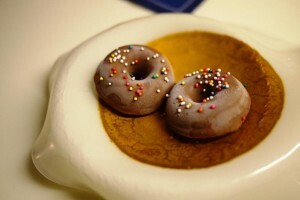 One of my very favorite treats is Krispy Kreme doughnuts. Here they are deconstructed and re-formed into chocolate-covered ice cream. I am nearly moved to tears. Other bites include cleverly presented sesame pocky stick, raspberry wasabi bon bons, and saffron pâté de fruit. 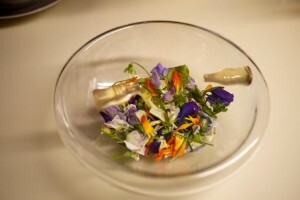 A bowl of flowers is wrapped in plastic, and perched atop are gummy shaped whiskey bottles filled with Japanese whiskey. This experience is beginning to transport me out of reality, and into a food and alcohol-induced state of euphoria. I forget that it’s my birthday until a gorgeous cotton candy cake is placed before me. It’s time to make a wish. I close my eyes and inhale slightly. I have spent the last three hours focused solely on this sensational meal. Pavarotti would approve. When it comes to eating, I wish for nothing more.